How can you become a successful community worker? What is counter hegemonic community development? What are alternatives to current power structures? These are just some of the questions Dean Cawsey explored in an interview with the After Coal production team this summer in Wales. I didn’t develop the questions, schedule the interview, or check the audio levels on location. I had no idea who Dean Cawsey was. Yet, I found myself in a windowless office in Boone, North Carolina, pushing a tape labeled “Dean Cawsey 1” into the deck. For the countless time, I picked up my pen, hit the spacebar to begin playback, and began scratching time code on the margin of the legal pad. This is the work of documentary film. It is hours of preparation, even more hours of filming, and even (even) more hours of crunching media, taking notes, and weaving together the best moments. 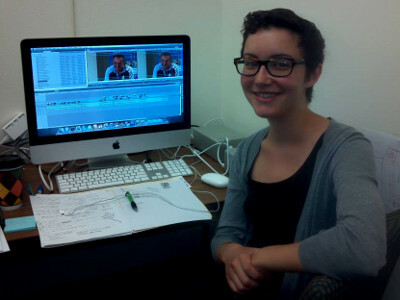 Don’t get me wrong — I love working on film projects, and love working on After Coal as a production assistant. However, in the monotony of media capture, I was unprepared for Cawsey’s testimony. I quickly realized I was trying to scribble every word into my log notes. Once the typed transcription was on my desk, half of the content was highlighted. I was truly inspired by the work Cawsey does in Wales, and felt refreshed to see the world (if for a moment) through his lens. Angela Wiley, After Coal Production Assistant. “It’s easy to say, ‘It’s not my child, not my community, not my world, not my problem.’ Then there are those who see the need and respond. I consider those people my heroes. On this note, the following snapshot of Cawsey’s work is a note of encouragement to anyone working behind the scenes, in social services, to anyone trying to subvert oppressive systems, and to those that want to make an impact on the world. Cawsey is the Communities First Cluster Manager in the Western Valleys region of Wales. For eleven years, he has been pursuing the program’s mission of “tackling poverty and social disadvantage”. Most people in the focus areas are directly in search of employment. Cawsey’s task is to involve clients in community services and classes where appropriate on their path to building a skill set. Another program goal is to work directly with organizations and social services to improve programming. In this sense, Cawsey’s job is to directly support communities by working intentionally with individuals and larger entities. Cawsey reflects that, “…whilst individuals are getting involved in a process where they can improve their chances of removing themselves personally from poverty, what they’re also doing is building community resilience and supporting that community”. Even though I work in libraries and on creative projects like After Coal, I grapple with these issues each day. Patrons in the library enter and are looking for jobs, but need computer skills to fill out online applications. Participants in the After Coal documentary are both excited and apprehensive about what the future could offer for their regions. It is easy for me to get wrapped up in the tasks at hand, and forget the possibilities inherent in library work, or the potential impact of a given film. What I enjoyed most from listening to Cawsey was the context he was able to wrap around his work, even after a decade of formal dedication through Communities First. 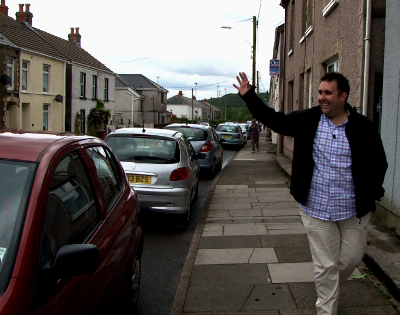 Dean Cawsey walks in his neighborhood of Banwen, Wales. The work in the Dulais Valley, and in communities all over the world is not 9-5. It requires workers to become embedded in the social fabric, it calls for active listening, creativity, and sometimes miraculous patience. To Dean Cawsey and to all those trying to improve their pocket of the world — thank you for what you do. And thank you in advance for continuing. We need you, and you are my hero.